The Australian city of Sydney is many things to many people. The state capital of New South Wales is the most populous city in Australia. Depending on your point of view Sydney is the southern hemisphere’s business hub, a party city, a city of culture, a surfer’s paradise or capital of pavement coffee culture. For me, Sydney is a naturalists dream. There are few cities in the world that offer such a rich diversity of wildlife in and around the city in parks and gardens, combined with glorious national parks within an hour travel time. Many people live and work day to day without realising the life that flourishes around them. Sydney is a famed the world over for her truly stunning harbor; turquoise waters surrounded by pristine beaches, tropical vegetation and iconic architecture. For the naturalist though, it is the short journey through the towering harbour gateway of the North and South Heads that reveals some of Sydney’s extraordinary natural secrets. The stretch of ocean between the spectacular sandstone cliffs of the New South Wales coastline and the continental shelf, with its sheer drop around 25km or 15 miles from the harbour mouth, is a treasure trove of life. Twice a year the Southern Hemisphere Humpback whale migration passes close enough to the coast for these leviathans to be visible from the cliff tops spouting their acrid white breath. For a small amount of money, though a whale watching vessel makes a more personal experience. The boat, boarded at Circular Quay can be amongst pods of these beautiful, serene creatures within 30 minutes. From April to July the migration heads north to the warm waters of Queensland to give birth. The southern migration from September to December sees the adults returning with their calves. 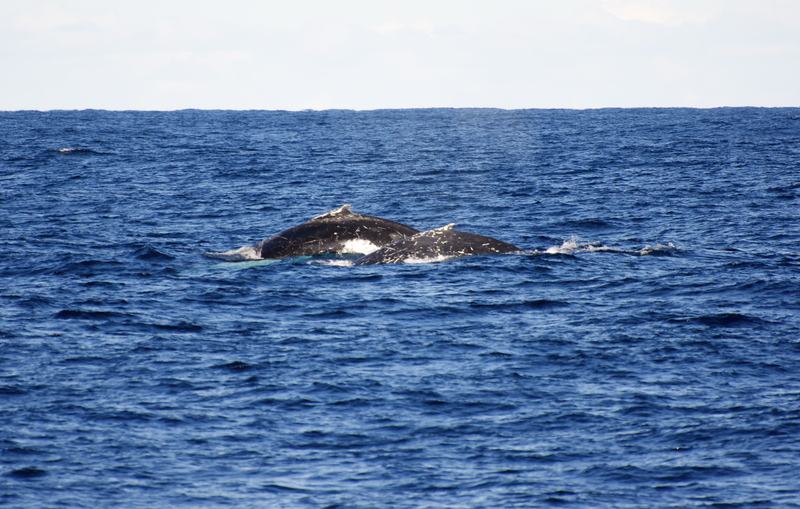 It would be uncommon to not see whales on a trip out from Sydney. There is also the frequent treat of seeing or even being followed by pods of dolphins or the occasional seal surfacing in the white water that foams around the rocks at the harbour mouth. For the more extreme naturalist, wake up earlier, take a smaller, faster boat and head for the continental shelf. 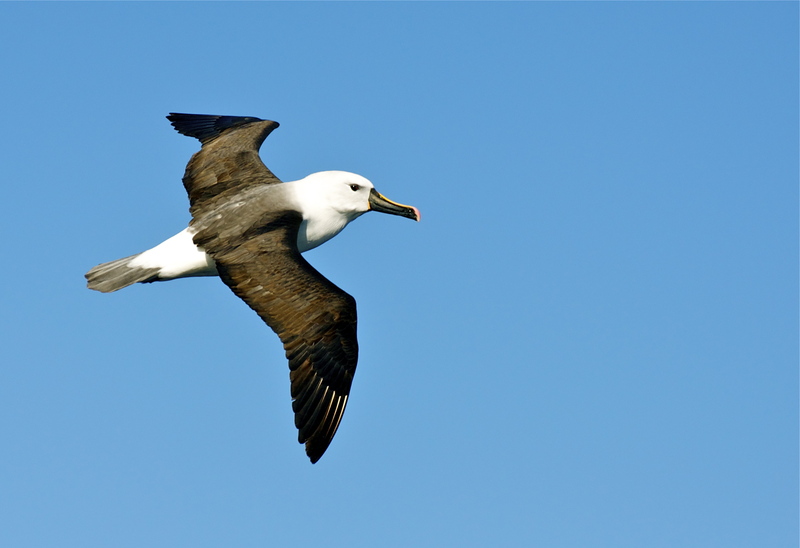 Here is where you can find birds in abundance, and not just any birds, albatross! At 10 years of age I was aware of the 2 largest flying birds; the Andean condor and the Wandering albatross. I dreamed of seeing these birds one day, having watched them on BBC documentaries. I had read that it was possible to see the Wandering albatross from Sydney, but it was a long shot as it was out of season. I did, however have chances to see a number of other albatross species, and this was an exciting prospect. I bought a batch of fast speed SD cards and headed out on the Sydney Pelagics & Nature Watching Tours boat. The weather was clear and sunny but the wind was picking up. This was going to be a bumpy ride, and a nightmare for photography. It is hard to track a flying bird in the camera lens when the boat is rising and falling on a heaving swell. At this point it is only fair to point out that you might want to make sure you have taken your motion sickness tablets. It is a long, messy and unhappy trip for the under prepared. Forty five minutes in to the trip and the first albatross start to follow the boat. I had seen albatross from cliffs before but never at this close range. 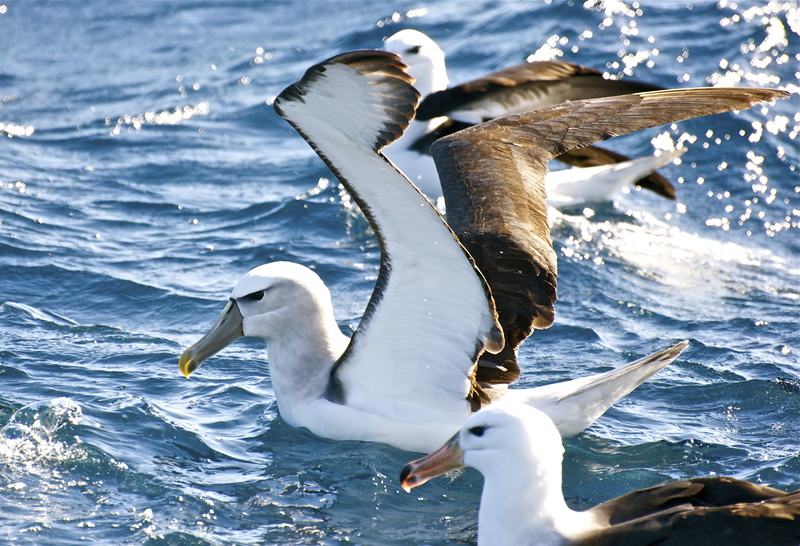 The first and most frequent visitor to the boat was the Black-browed albatross. These were ever-present, in numbers throughout the trip. The captain of the boat threw some ‘chum’ or chopped waste fish over the side and more sea birds joined the party. In amongst the Black-browed we spot the Campbell albatross with the beautiful clear eyes. This vulnerable species breeds at a single location, globally (Campbell Island). 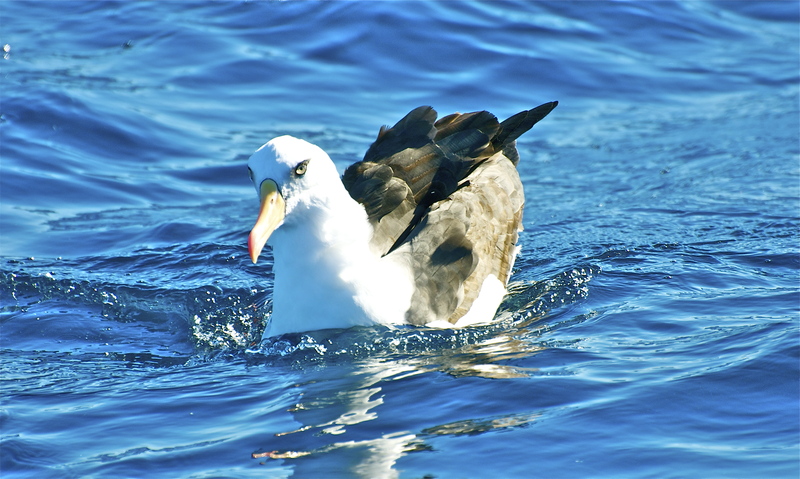 Soon the Shy albatross joins the feeding frenzy, landing on the water amongst a small group of Black-brows. This is the largest species of albatross that we saw on the trip with a wingspan of up to 2.75 meters (9ft). The Shy albatross is endemic to Australia having only 3 breeding locations, all of which are small islands off the coast of Tasmania. 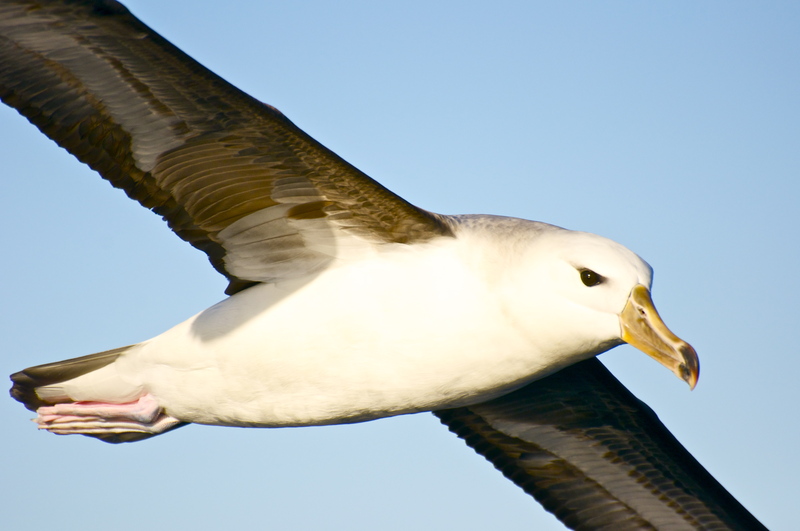 Buller’s albatross is a truly splendid bird. The silver-grey head sets it apart from its largely white bodied relatives. Easy on the wing, Buller’s was the least seen but, one beautiful bird kept us company, following the boat back towards Sydney cruising low above the rough sea, often just a few meters behind the boat. The Indian Yellow-nosed gave us a fly-by on several occasions, conspicuous by the bright yellow strip running the length of the top of the bill. This endangered species is in rapid decline, despite having a number of breeding colonies. A number of other notable sightings that I recorder on this and other trips include the Northern and Southern Giant Petrel and the usual terns, Fairy prion and Short-tailed shearwater. I did not get to see my bucket-list bird, the Wandering albatross but with five species seen and photographed, and an opportunity to spend time in the company of these most graceful of birds was a privilege. I live in hope that the elusive Wandering albatross will be the subject of a future blog. Where would you go to see the Wandering albatross? Oh! Your shots of the albatross fill me with a sense of elation :). Spent some time sailing in have Pacific, New Zealand – Hawaii and the sea birds were fellow voyagers …. 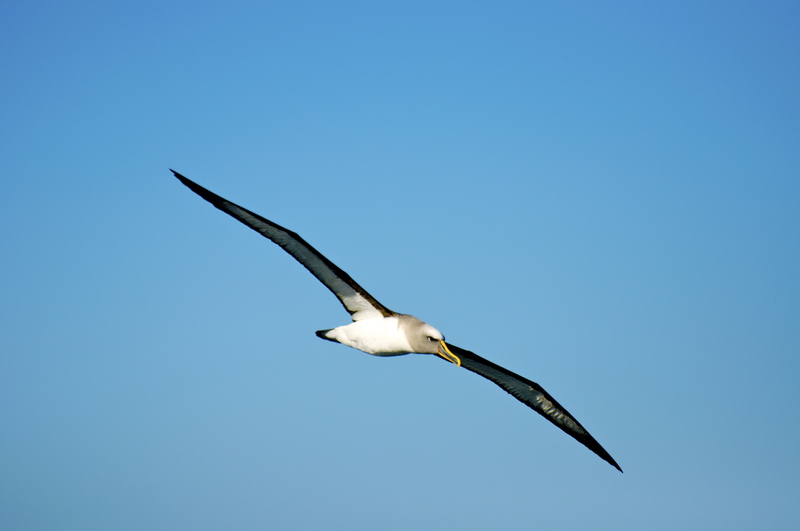 Wandering Albatross are sometimes spotted here off the Cape (South Africa) waters once out over the continental shelf. And further south, the remote Kerguelen Islands where they gather to breed and nest. Thanks for your kind words. It is strange how the sight of an albatross seems to be good for the soul. It seems to fill us with a yearning for ocean adventure and faraway lands. I’ll certainly looking for an opportunity to see the Wandering. The more of your posts I read the more envious I become of all the grand adventures you have experienced. The typical amazing pictures are half the draw and the explanations of the where, why and how you achieved them completes it for me. Thanks for another great post. Pretty much house bound, but sharing space with my three sons, three felines, two canines that inhabit the space with me, I have my own “creatures” to enjoy. The added plus is the view outside my room where geckos, squirrels, feral cats and the local skunk come to look in at me as if I were the one in captivity. Add to that various birds who sing to me every morning and night, especially my favorite mockingbird, and I am blessed to experience as much wildlife as I do, so no complaints here. But online I get to enjoy people like you who share your experiences via your words and pictures and that is a gift beyond measure! Thank you for the gifts already given, I look forward to many more! Lovely photos of the albatrosses, David. A spectacular bird we are so lucky to have on this planet.